Meanwhile, last night hundreds of people gathered for a candlelight vigil for Leelah in Ohio. 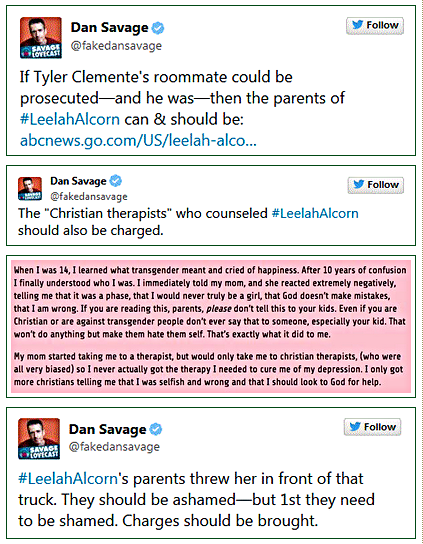 CNN got a brief quote from Leelah’s mother who still refuses to recognize Leelah’s gender as female. When Josh Alcorn voiced a desire to live as a girl, the Ohio teenager’s parents said they wouldn’t stand for that. “We don’t support that, religiously,” Alcorn’s mother told CNN Wednesday, her voice breaking. “But we told him that we loved him unconditionally. We loved him no matter what. I loved my son. People need to know that I loved him. He was a good kid, a good boy.” Crossing out the name “Josh,” the 17-year-old signed the name “Leelah” in a suicide note posted to Tumblr. The note was programmed to publish after Alcorn’s death Sunday. The teenager was struck by a tractor-trailer on Interstate 71 around 2:15 a.m., about four miles from home in the tiny town of Kings Mills, northeast of Cincinnati. The Ohio State Highway Patrol is investigating the death as a suicide. Leelah Alcorn’s tortured yet eloquent Tumblr account has been deleted. It is unknown if this was done by the request of her family.